FOXBOROUGH, Mass. (AP) Patriots quarterback Tom Brady says his injured knee feels better than it did after last game. A day after leading New England to a 22-17 win over the New York Jets , Brady said the knee was acting up during the game. But he said he hopes it will be better on Sunday, when the Patriots play the Los Angeles Rams. It's not known when or how Brady injured the knee. He missed two practices last week because of it but returned to the field on Friday. 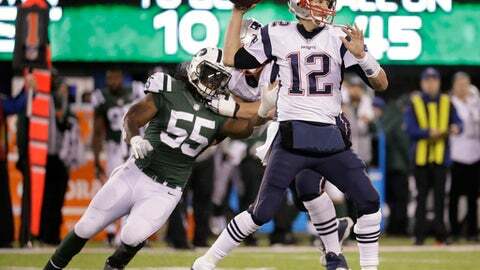 Brady went 30 for 50 for 286 yards and two touchdowns in the victory over the Jets. Coach Bill Belichick did not comment on injuries to Brady or tight end Rob Gronkowski during a conference call with reporters on Monday.